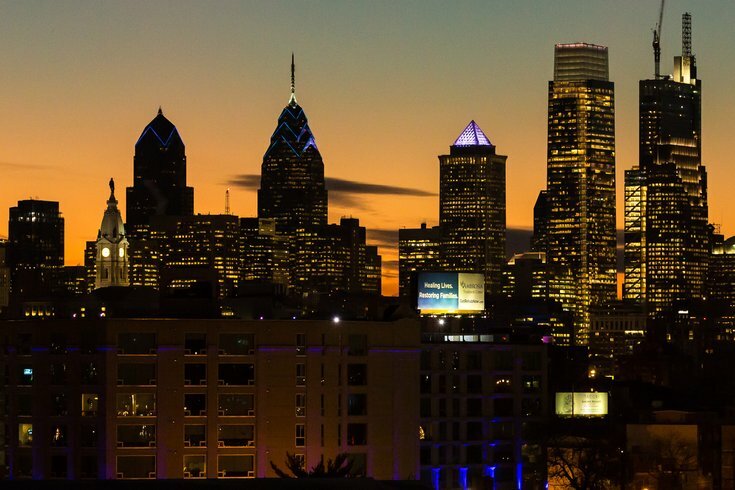 The Philadelphia skyline at dusk. A new report from Linkedin delves into the priorities of professionals in different cities across the U.S., revealing that Philadelphia-area workers place a high value on company culture – sometimes surpassing the value of the company itself. The report, "Workplace Culture Trends: The Key to Hiring (and Keeping) Top Talent in 2018," surveyed Linkedin members to learn more about employees' work-life preferences as employers face a mass shortage of employees with soft skills (things such as people skills, communication, and general social skills). Linkedin quantifies the shortage at 1.4 million. Nationally, the survey found that 70 percent of professionals would not transition to a leading company in their field if it meant sacrificing company culture. In Philadelphia, that percentage is even higher – more than three-quarters of workers – 76 percent – said they would not tolerate a bad corporate culture for a job at a top company. Eighty-one percent of Philly professionals said it is important they have pride in the company for which they work. What makes them proud? Fifty-six percent said good work-life balance and flexibility is the biggest factor. Close behind, 51 percent of Linkedin members said that having a positive societal impact through their jobs was another significant factor in generating pride in their companies. The third important factor, at 45 percent, is a positive workplace culture where workers feel they can be themselves. Despite this emphasis on culture and flexibility, the most important thing keeping Philadelphia-area employees in a job for at least five years comes down to the nitty gritty: benefits. Forty-eight percent of area professionals said benefits such as paid time off, paternal leave, and good health insurance were top priorities at sticking with a job for the long term. Nationally, benefits were the second most important factor, at 44 percent, close behind a comfortable, accepting workplace environment (46 percent). Check out the full survey findings here, including Linkedin's tips for employers on how to retain talent.